The 2014-15 Miami Heat schedule kicks off on October 29th, 2014 at home against the John Wall led Washington Wizards. This season will be the first without star player LeBron James who left the Heat this past off season to rejoin the Cleveland Cavaliers. The Heat will get to face off against their former star when the Cavs come to town to play on Christmas Day. Miami wraps up the 2014-15 NBA regular season play on April 15th, 2015 at home against the Philadelphia 76ers. 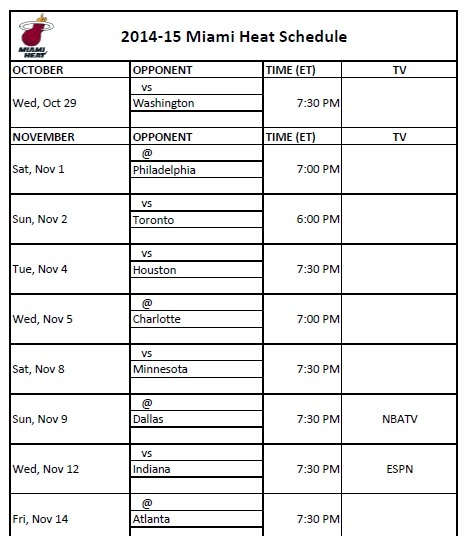 The following printable 2014-15 Miami Heat schedule is provided for those who would like to print out the team’s schedule for the 2014-15 NBA regular season.